Welcome to another week of What's for Supper Sunday! 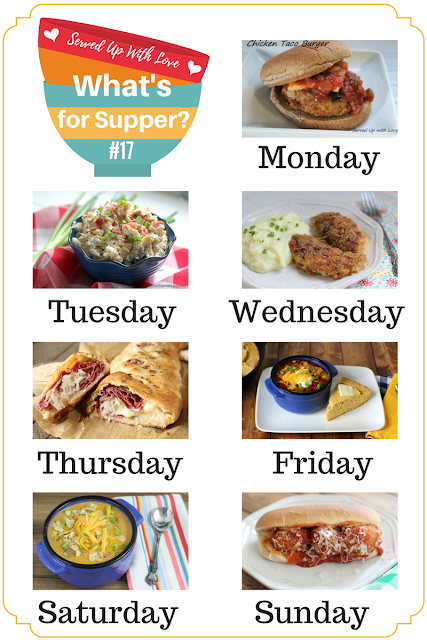 Deciding what to fix for supper has been super easy since I started meal planning. We have a busy week ahead (seems like most of them are) so we are going to use that crock pot like nobody's business. Busy or not I just love using mine. It makes meal time even easier. Oh So Good Crispy Chicken was on the menu a few weeks ago and our daughter devoured it. It is her absolute favorite so I added that in again this week. We've got some chicken recipes along with some soups and everything in between. If you are following along with the meal plan this week, all you have to do is click on the recipe title and it will take you right to the recipe so you can make it too. Enjoy! I'd love to hear how these meal plans are helping you get supper on the table every night. Leave me a comment below and let me know how we are doing.